There are Sannidhis for Rama and Andal.The Lord gives darshan in sayana with His right hand in Upadesa Mudra. 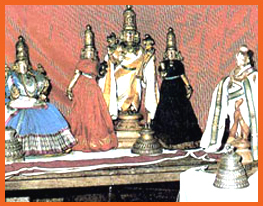 Pundareega Maharishi is seen standing with folded hands at the Lords feet. As per Sthala purana, Pundareega Maharishi with lotus flowers desirous of worshipping the Ksheerabdi nathan walled westwards and found the sea preventing him. The Maharishi with Bhakti blinding him, started clearing the water with his hands. The Lord came in the guise of a old Brahmin and asked for food. When the Maharishi came with the food, he found the Lord as in Ksheerabdi in sayana form on Adisesha adorned with the flowers brought by him. Hence called Sthalasayana Perumal. Mahabalipuram is very famous for its sculpture. The important among them are Bhagiratha thapas, Panchapandava Mandapa, Govardhan Mandapa, Arjuna Tapas , etc. Theertham - Pundareeka Pushkarini, Garuda river. The Perumal found in this sthalam is Sthalasayana Perumal He is found in Kidantha kolam in bhujanga sayanam (sleeping) and facing his thirumugham towards East direction along the sea.On the right hand side on his heart, Gnana Upadesh known as "Gnana Tamiz Purintha Naan" is found. The Moolavar is Thiru Vada Enthai Varaaga Moorthy on west part of Kalangarai Vilakkam (light house) near the Cave Temple. Utsavar - Sthala Sayana Perumal (Ula Kuyya Nindraan). This sthalam, Thirukadalmallai is also called as "Mahabalipuram" and "Mamallapuram". It is situated in Tamil Nadu. 40 Kms away from Chennai and 7 miles from Thiruvidanthai.